For decades, archaeologists thought that South America was populated by ancient humans from Asia who crossed over a land bridge in the Bering Strait into Alaska about 13,000 years ago during the last Ice Age. From there, these ancient people - referred to as the Clovis culture after their stone tools were discovered near Clovis, New Mexico - spread southward through North America down to the southern tip of South America in a single slow migration. More recent research has caused scientists to question whether the Clovis are indeed the first and only people who migrated throughout the Americas. Last week, results of three separate DNA studies were published, providing more evidence against the single migration theory. What did the DNA Studies show? Researchers for the recent DNA studies looked at over 100 DNA samples that ranged from 500 to over 10,000 years. By comparing DNA over this time range, they’ve found evidence that there were at least three separate waves of migration through South America. The first wave was associated with the Clovis culture. DNA samples from Brazil, Belize, and Chile ranging from 9,000 to 11,000 years old were found to be related to a baby boy from the Clovis culture living in Montana about 12,800 years ago! Even though scientists now question long-held beliefs on human history in the Americas, there is no doubt that the Clovis culture did have an impact. In genetic samples younger than 9,000 years old, scientists started seeing fewer Clovis-related signatures. This led them to believe that a second migration wave occurred at this time. Not much is known of this new population, but scientists can trace their path from Mexico and Central America down to Brazil and Chile. In fact, this wave appeared to have completely replaced the Clovis people of the first wave. The DNA of modern native South Americans in multiple areas are related to the second wave. The third wave occurred about 4,200 years ago when inhabitants from the Channel Islands migrated into the Central Andes area. Descendents from this migration are still in the Andes today. An interesting finding is how they adapted to living in the Andean highlands where the air is thinner, making it hard to absorb oxygen. Researchers found an increase in a genetic variation that led to stronger hearts. This was a surprise because Tibetans, another population living in high altitudes with thin air, had genetic variations that increased their blood’s ability to carry oxygen. Scientists had not expected that our bodies would respond differently to similar environments. While these studies have uncovered more details about our history in the Americas, they have raised questions as well. For example, did the third wave of migration really only started 4,200 years ago or have we simply not found any older evidence? The studies also found one ancient group in Brazil that shared DNA with modern indigenous Australians. This confirmed a theory that the two separate regions shared a very early group of ancestors. 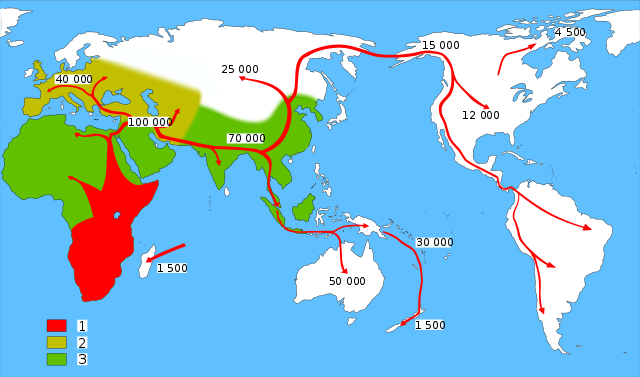 However, scientists don’t know how the ancestors separated and migrated to different continents. They don’t believe these ancient people traveled across the Pacific Ocean so the only possible route is across the Bering land bridge. Unfortunately, researchers have not yet found any Australian DNA in any genetic samples from either North or Central America. To find out more, scientists are continuing to work with native Americans to collect their DNA, both from today’s population as well as their ancient ancestors.